7mths notice for the UK/Euro tour !! I wonder if there'll be a min Irish tour somewhere in between? Possibly around Christmas? Rocky wrote: I wonder if there'll be a min Irish tour somewhere in between? Possibly around Christmas? Good shout! They might announce something after EP hopefully. Colm wrote: Good shout! They might announce something after EP hopefully. Here's hoping anyway. I'm seeing them again in Boston in Sept which will be my 3rd time in a row to see them in America so I'd love to see them in Ireland again. Bell X1 hit the road for a Field Recordings-promoting acoustic tour that takes them to the Riverbank, Newbridge (October 25); Spiegeltent, Wexford (26); Glor, Ennis (27); Hawk’s Well Theatre, Sligo (28); Set Theatre, Kilkenny (November 1); Triskel, Cork (3); De Barra’s, Clonakilty (4); St. George’s, Carrick-On-Shannon (8); INEC, Killarney (9); Town Hall Theatre, Galway (10); Dolan’s, Limerick (16); Vicar St., Dublin (17); Empire Music Hall, Belfast (22); Balor, Ballybofey (23); An Culturlann, Derry (24); Theatre Royal, Waterford (December 1) and Spirit Store, Dundalk (15). Sweet, will defo have to pop to the Cork show. Going to Vicar St. Bringing my 11 year old daughter. She's seen them before at a mini gig in HMV but this time, i'm treating her to a proper Bellexian gig. Told the guys afterwards that they need to come to Cleveland next time! They played Motorcades in Boston last week too, I really liked it. The only other song they played somewhat out of the ordinary was In Every Sunflower which was beautiful. A shoutout has to go to Duke Special who won himself a lot of fans on the night it would seem. I haven't bought any album since his third and had pretty much forgotten he existed but he came out and played a song. Then he stood up and introduced himself, told a great story about his next song, played a couple, explained another song, gave out songsheets for people to sing along (with all of his information for people to take home so they wouldn't forget about him) and he was very engaging between sets and again after the Bellies left the stage. The audience seemed to eat it all up. I missed the beginning of Duke Special's set, but I was impressed with how he got people to sing along. I've never had a sheet with lyrics passed out at a show - nice touch! He also broke a piano string, which must be really hard to do? All of a sudden we heard a loud zinging sound, and it hit one of the stools on the other side of the piano. "Someday, we'll be the fairest of them all." No piano at the gig? That's a shame. It was very cool to have a piano at the gig in Boston. More importantly, how was the new song? Looks like we got a similar enough setlist in Manchester. Might have missed 1 or 2 as it doesn't seem like a 90min set. 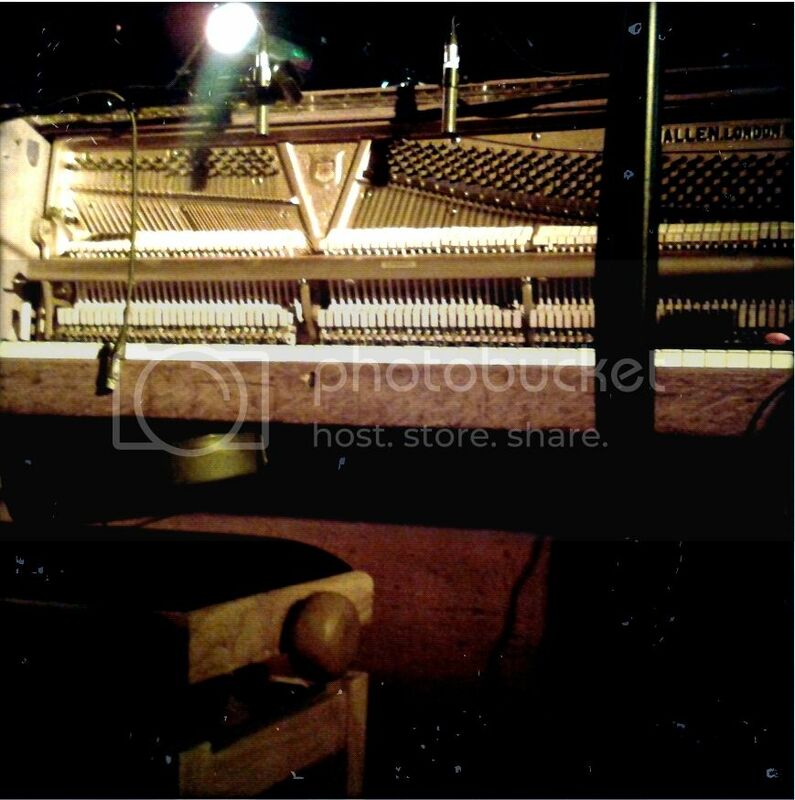 Here is photo of Dave's piano ... A gorgeous battered old thing with no front on it, so the Action was exposed. I can't state how much of a difference this made, compared to his usual keyboard. For me the keyboard never quite sounded right. Real bonus of these UK dates is the size of the venue ... Its like an Irish tour circa 2001. Got pretty close to the stage & for the opening song, I could hear Dave's strings scraping on the frets. Nice. So, how are we all getting on with the current tour ? I got to the Manchester gig. Lovely time was had by all. I gots tickets for 21st December. The NCH earlier in the year was most excellent.